Republicans don't want to repeal Obamacare anymore. 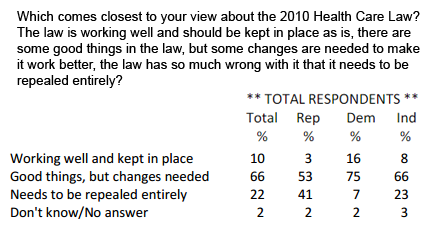 According to a new poll more Republicans want to fix Obamacare than repeal it. Read more about Republicans don't want to repeal Obamacare anymore. Four sellouts apparently want to be challenged in the next primary election by real Democrats. Too overwhelmed, where do I begin? Read more about Too overwhelmed, where do I begin? The propaganda worked... now what? This post is not for hard facts and details. This is an intentionally fuzzy view of things from my perspective. I won't be trying to change your mind or convince you of anything. I have nothing to sell, and I am not trying to sway you to my way of thinking. OK, let's move on. Read more about The propaganda worked... now what? At Finding Assange, they were promising to release a huge dump of new Podesta emails. They just added a header to note that they will NOT release if Julian goes on the radio.